Habit: Biennial 3--20 dm. Stem: generally 1, +- openly branched in distal 1/2, loosely tomentose, often glandular-hairy. Leaf: adaxially with slender appressed bristle-like prickles, sometimes +- tomentose when young, abaxially +- tomentose; main veins prominently raised abaxially, +- glandular; proximal 10--40 cm, sessile or wing-petioled, shallowly to deeply 1--2 × lobed, main lobes generally rigidly spreading, spine-margined, otherwise entire, tip prolonged, cauline gradually reduced, long-decurrent as spiny wings, generally spinier than basal, main spines <= 15 mm. Inflorescence: heads 1--several, +- clustered, closely subtended by bract-like distal-most leaves; peduncle 1--6 cm; involucre 3--4 cm, 2--4 cm diam, hemispheric or bell-shaped; phyllaries graduated, tips linear to lance-linear, spreading to reflexed, spines 1--5 mm. Flower: corolla 25--35 mm, purple, tube 18--25 mm, throat 5--6 mm, lobes 5--7 mm; style tip 3.5--6 mm. Fruit: 3--4.5 mm; pappus 20--30 mm. Chromosomes: 2n=68. 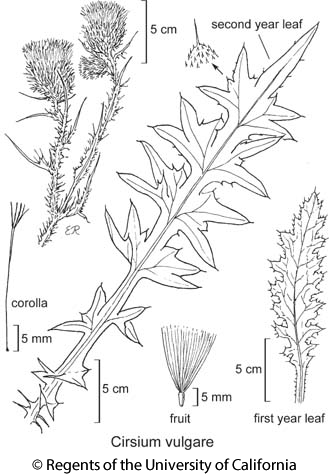 Citation for this treatment: David J. Keil 2012, Cirsium vulgare, in Jepson Flora Project (eds.) Jepson eFlora, http://ucjeps.berkeley.edu/eflora/eflora_display.php?tid=2285, accessed on April 21, 2019. CA-FP, GB; Markers link to CCH specimen records. Yellow markers indicate records that may provide evidence for eFlora range revision or may have georeferencing or identification issues. Purple markers indicate specimens collected from a garden, greenhouse, or other non-wild location.